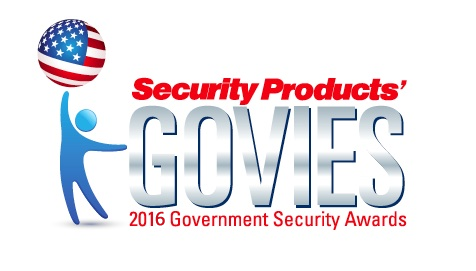 Las Vegas, Nev., April 6, 2016 - Security Products magazine, the only integrated product and technology magazine reaching the entire security market, and securitytoday.com, the preeminent editorial website for the security industry, announced the 2016 Platinum and Gold winners in the Govies Government Security Awards competition today at ISC West. The awards honor outstanding government security products in a variety of categories. ISC West is being held April 6-8 at Sands Expo Center in Las Vegas, Nevada. 1105 Media's Security Products, securitytoday.com and GovSec branded media offer important information to the government security market through a vast portfolio of products. The Security Products' Government Security Awards were launched in 2009 and re-launched as The Govies in 2011. "It's exciting to have the opportunity to honor so many outstanding government security products," said Ralph C. Jensen, editor-in-chief of Security Products. "Government security is more important than ever, and ISC West is an ideal venue for companies to show off their products to the industry." President and group publisher of the Security, Safety, Health & Facilities Group of 1105 Media, Kevin O'Grady, echoed those comments: "I am thrilled with the great participation we had in The Govies program this year and look forward to seeing many of the winning products on the show floor." Details about The Govies 2017 awards program will be released later this year. 1105 Media's Security Products, securitytoday.com, GovSec, Campus Security & Life Safety, Networking Security, and Dealer Strategies are leading industry media brands that provide new product and technology solutions for security professionals. The brands' print, digital, custom media and research products integrate physical and IT security coverage and provide the smartest, most cost-effective solutions for reaching security decision makers.